Unit 2 is complete! Click the pic to download them. You can see how I used these in my classroom here and you can find the rest of the units here. :) I'd love to hear from you if you use these in your classroom. Feedback is always appreciated! These are great! We do not use SF but most scope and sequences are similar. I have choices for Word Work. I use Daily Five for literacy stations. I have making words, sorting, word games, and buddy sort tubs. I wanted one more for this year. I am thinking of using these and having a words in text tub. I think it is easy to forget to reinforce using words in text making stations/centers. This is a great way of doing this. Thanks for all your hard work. Thanks so much! My kids loved these last year! We didn't use Reading Street, but it was great reinforcement for the sounds. We would read the story whole group, highlight/circle the words, then they would answer the questions on their own. This year I'm looping with my kids, so it may become a center/independent activity. Thank you so much. This completes my set! Thank you so very much! 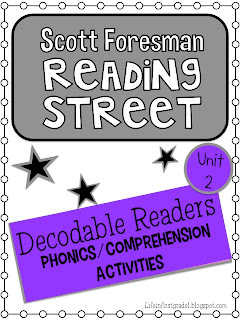 We use Reading Street, and I liked these better than copying the actual decodable readers. The comprehension portion was a great assessment, and the students loved using the highlighters. I am going to miss you in first grade! Thank you for all the incredible freebies you have provided for this reading series. It is greatly appreciated! LOVE these!! Used them last year and was really hoping you'd finish them before your big move to 5th grade! These are awesome, and I truly appreciate all the hard work you put into them! I love your Reading Street things! They have helped me to really enrich my Reading lessons! You're amazing! I used these last year and my students loved them! We use Reading Street and they were a great independent activity for my kids during center time. I plan to use them during Daily 5 this year. Thanks so much!! Thank you so much for these great resources. My class really enjoyed them last year. We really appreciate your kindness and hard work. You are terrific!!! Hi. I love these... did you ever do unit 3 and 4?